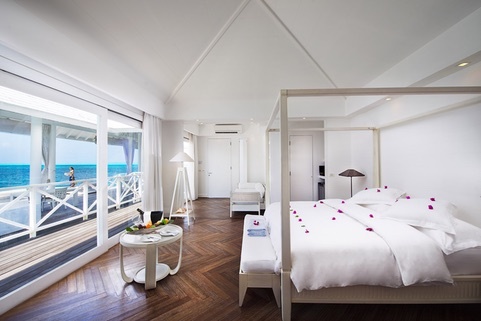 Beach Bungalows, Beach Junior Suites, Water Villas, Jacuzzi Water Villas and Two Bedroom Water Villas characterise the island. The inimitable Italian decor of the rooms, equipped with every comfort, guarantees our guests an exclusive holiday in an oasis of tranquility. 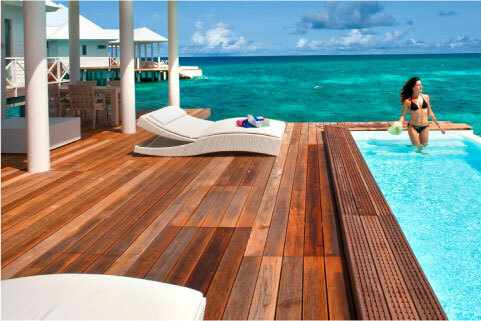 Water Villas enjoy a large private terrace with direct access to the ocean. 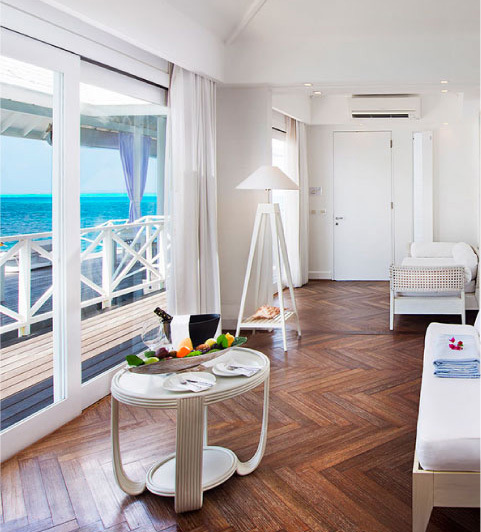 All of the rooms enjoy a large living area, tastefully decorated with elegant furniture, a four poster bed, a comfortable sofa and corner bar, contemporary Italian lighting and beautiful parquet floors. The Maakana Restaurant, located in the south side of the resort, next to beach, overlooking the blue ocean, is serving breakfast, lunch and dinner. Offers a sumptuous buffet with choices to satisfy every palate and vegetarian and vegan. The international breakfast buffet offers a wide selection of fresh tropical fruits and juices, homemade breads and pastries, European cold cuts and cheeses, and made-to-order eggs cooked by the chef at the cooking station. The lunch buffet offers a wonderful variety of options from pizza, to pasta, to salads, and a barbeque grill where the fish catch of the day and a selection of meats are cooked to perfection in front of your eyes. Local dishes are served every day and many other international options offered. The dessert buffet serves fresh fruits, cakes and creams and home made “Gelati”. The dinner buffet is featuring a different theme every night, from Mexican/Seafood/Asian/ BBQ/ Maldivian Night/ Italian and international. The best of fusion cuisine and European and Asian tradition for an exclusive culinary experience. The over water restaurant offers a la carte fusion cuisine, located in west side of the sea, where modern European and Asian dishes meet in an explosion of flavour. From Christmas to Easter, a special guest chef from the well-known “Jeunes Restaurateurs” association will be on the island to delight the senses with unique dishes prepared especially for our guests. Since it is a la carte the last order has to be made 15 minutes before closing time. Our Water Villa guests have all these services as part of the all-inclusive package and for an additional fee our Beach Bungalow guests can enjoy the same experience by simply reserving in advance & an additional rate. Experience the best of Japanese cuisine with is a unique live cooking experience in the middle of Indian Ocean. The Japanese open air restaurant is a unique live cooking experience. Overlooking the ocean and our beautiful reef. The specialized chef cooks a selection of seafood and meats on the Teppanyaki grills. Restaurant is at extra cost and Reservations are required. 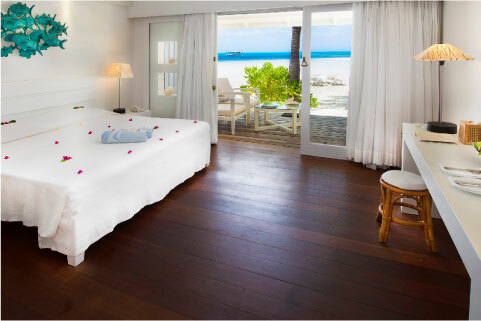 An ideal place to relax and unwind after exploring the magnificent underwater sea life, or for those who want to stay on the beach, sunbathing on the white coral sand. A comfortable open air sitting area serving International cocktails, selected spirits, beer, wine, fruit juices and soft drinks. Champagne and premium spirits are also available for an extra charge.